Laminate flooring has grown in popularity over the years as a replacement for carpeted and tiled rooms. Easy to clean and maintain, laminate proves a suitable flooring material for kitchens and living areas. There are a range of laminate styles and designs and the cost associated will affect how hardwearing and aesthetically appealing the floor will be. Laminate simulates wood and sometimes stone, without the problems you’d expect with both materials. Its success in the home improvements industry is largely down to the ease of installation. It also costs less than traditional flooring, whilst being durable and hygienic. 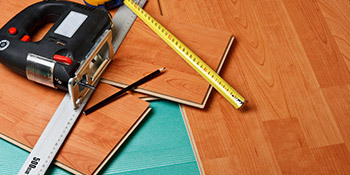 Laminate flooring is often chosen because it’s so easy to install. It’s fitted using a tongue and groove system, which click the boards into place. Glue can also be used to secure the flooring further and ensure it doesn’t lift or come loose later down the line. And just like carpets, laminate is fitted on underlay, which adds to the comfort and reduces sound. There’s often a gap between the edge of the flooring and the wall too, in order to allow the flooring to expand and retract at ease when the temperature changes. Skirting boards are often removed and reattached after the laminate has been successfully laid. Cheap laminate flooring has grown in popularity and is now first-choice for many homeowners decorating their kitchens and living rooms. The ease of installation and maintenance makes it a must have and new builds often have laminate throughout the property’s bottom floor. If you’re interested in modernising your home with laminate flooring, just complete our quick form and receive up to four FREE quotes from local, vetted and reputable companies. Project: 20 square metres of laminate fitted in dining kitchen. Project: Would like laminate flooring fitted to the hallway and the living room. We would also like to ask for a quote for Vinyl flooring for the kitchen / conservatory. Thank you. Project: I need about 5 -6 pieces of pine color laminate flooring.